Rector Associate Professor Velichko Adamov, Ph. D.
Type of courses Bachelors programmes are offered to both full and part-time students. Masters programmes are offered on a full-time and distance basis. Bachelors programmes are nine semesters (four and a half years) in duration, and Masters programmes run over three semesters (one year of study, and one semester for thesis development and defense). Student profile More than 11 000 full-time and part-time students study in the Academy, including foreign students from European, Asian and African countries. Bulgarian and foreign students may study in PhD programmes in various economic subfields. The “D. A. Tsenov” Academy of Economics administers programmes which award the qualification of "specialist in economics" from the College of Economics and Management - Svishtov. The College is an affiliated Institute for Qualification and Retraining functions within the framework of the Academy. Students are taught risk management, techniques of insurance and reinsurance, actuarial work, and investment portfolio management. The course is intended to provide specialized knowledge in social security management, economics and management of healthcare, organization and service of the labour market. Graduates are awarded the qualification "economist-insurer", "economist-actuary", "economist-social worker", "economist-health service specialist", "economist-stockbroker". The major of “Applied Microeconomics” aims to prepare microeconomists- analysts, capable to evaluate the main aspects of functioning and development of the national economy on a macroeconomic level and to turn it into a eco-social- market economy of theoretical and information type, which will be able concurrently to integrate itself into the international networks, including those of European Union. Students in this speciality are taught in accordance with the Act of Accounting, the Act of Trade, the National Chart of Account, international and national standards. The curriculum includes subjects similar to those taught in the E. E. C. countries. Graduates in this speciality are awarded the qualification of "economist-accountant". Students are taught in basic and specialized modules in the fields of economic analysis, control, financial accounting, trade law, financial law, taxation law, automated processing of auditing and analysis of company affairs. Graduates are awarded the qualification of "economist in auditing and analysis of company affairs". Students in this speciality are given a solid foundation in the methodology of generalized figure characteristics; planning, organizing and conducting comprehensive, descriptive and diagnostic statistical analyses. Graduates are awarded the qualification of "economist-statistician". The course is intended to provide knowledge and skills in surveying the domestic and international market, working out price prognoses and market strategies for increasing the competitiveness of companies, developing sale, investment and advertising policies, the technology of business planning. Graduates are awarded the qualification "economist-planner" and "economist in marketing". The course provides knowledge in technical programmes for computer systems, modern computing machinery, automated data processing and new information technologies, algorithms, programming languages. Graduates are awarded the qualification of "economist-application programmer" or "economist-systemsanalyst". The course provides specialized knowledge on the contemporary world economy, international marketing and strategic management, international finance, credit and insurance relations, modern processing techniques for studying the international market situation, business and economic relations, and two foreign languages. Graduates are awarded the qualification of "economist in international economic relations". The course covers contemporary management theory and practice. Graduates are awarded the qualification of "economist-manager". The curriculum covers the management of regional economy, localization of production, district and municipal organization, local self-government, methods of keeping public records, the economy of municipal employment resources. Graduates are awarded the qualification of "economist in public administration". 6. Management of Ecology The course provides knowledge in managing natural resources, ecological monitoring, carrying out research and prognoses, the safeguarding of ecosystems, and the management of ecorisk. Graduates are awarded the qualification of "economist-ecomanager". The course in “Forecasting and planning” is aimed to meet the higher social and economic expectations for the highly-qualified specialists, on an expert level. The complex and systematic knowledge provided to the students in the major of “Forecasting and planning” form a proactive behavior of the young professionals, feasibility and adaptation when applying the acquired knowledge, and also capability of dynamic teams working and carrier development. The curriculum includes organization, administration and book-keeping of company affairs, modern entrepreneurship in industry, marketing, devising business strategies in various industries. Graduates are awarded the qualification of "economist in industrial production". The course covers accounting, management, marketing, finance and taxation controls, organization of labour and finance in agriculture. Graduates in this speciality are awarded the qualification of "economist in agriculture". The course covers organization of supply, price formation, sales, advertising, entrepreneurship and middleman procedures in real estate, products and services exchange. Graduates in this speciality are awarded the qualification of "economist in trade". The students in the major of “Economy of Tourism” form their professional profile of knowledge and skills for team or individual performance about technology, managerial, selective, analytical, evaluative expert, prognostic and design activities, based on diversity and wide profile specifics of their training and theoretical studies, also workpalcements and training practice. The course in “Economy of Cooperatives” provides specialized training in accounting, finance, management, marketing, computer programme support and labour organization in all kinds of cooperatives. Graduates are awarded the qualification of "economist of cooperatives". The Center for Master Degree Courses and Distance Learning (CMDL) is a unit within "D. A. Tsenov" Academy of Economics that administers education in full-time, distant and extramural forms for the acquisition of the higher educational qualification degree "Master" for specialists in the field of the professional trends "Economics" and "Administration and Management”. CMDL provides the educational process administratively, technologically and methodologically, based on modern, high-efficiency and competitive information technologies; distribution of economic, administrative, managerial and computer knowledge among target groups of consumers and popularizing of the educational materials of "D. A. Tsenov" in the country and abroad. There are three sectors within CMDL: "Master’s Degree Courses", "Distance Learning" and "Foreign Students Education". 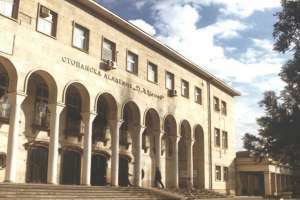 "D. A. Tsenov" Academy of Economics" is a founding and full member of the National Centre for Distance Education (NCDE) – Sofia. Distance learning is fully provided with training materials (textbooks, teaching aids, multimedia CDs, and a Web-site: wdo.uni-svishtov.bg ). The centre offers distance learning in 33 Master programs for economists (90 credits); 25 Master programs for non-economists (180 credits) and 23 Master programmes for college graduates (150 credits).